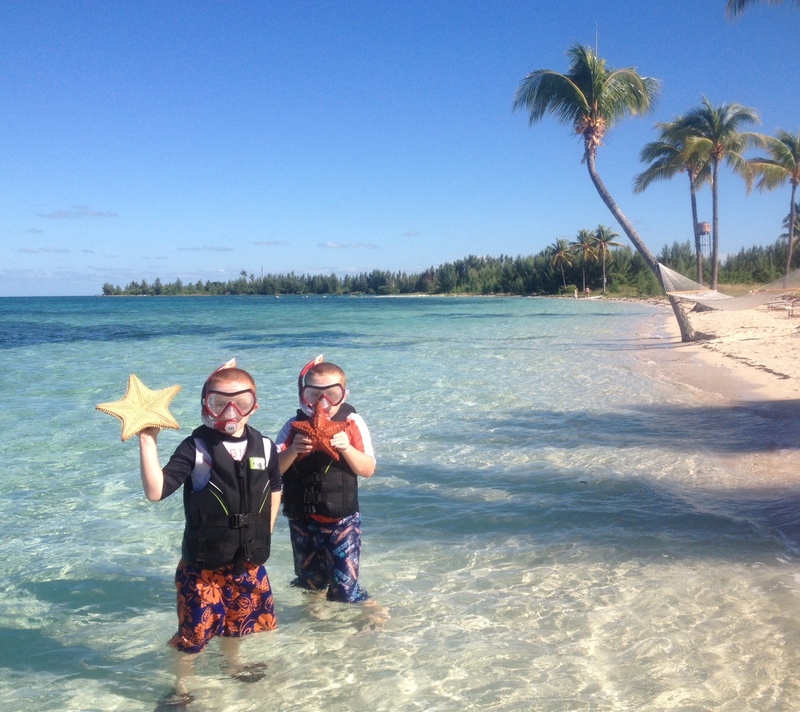 Since leaving the Old Bahama Bay Marina at West End on Grand Bahama Island, we have been exploring the Abacos. Our first day out, we transited the Little Bahama Bank, passing just north of Mangrove Cay to anchor in Northwest Harbor at Great Sale Cay (a run of 47 nautical miles) The entire day we cruised across unbelievably clear waters without seeing another vessel. When we got to Great Sale Cay, there were two other cruising boats already anchored but there was plenty of room for each of us to find just the right spot with good holding and clear water beneath us. After spending one night at Great Sale Cay, we elected to proceed northeast to Double Breasted Cay. We had read in the various cruising guides that this was indeed a special spot worth the slight detour north of our originally planned route. Entering Double Breasted Cay requires weaving through a very narrow passage as you wind your way around a series of coral heads and sand bars. 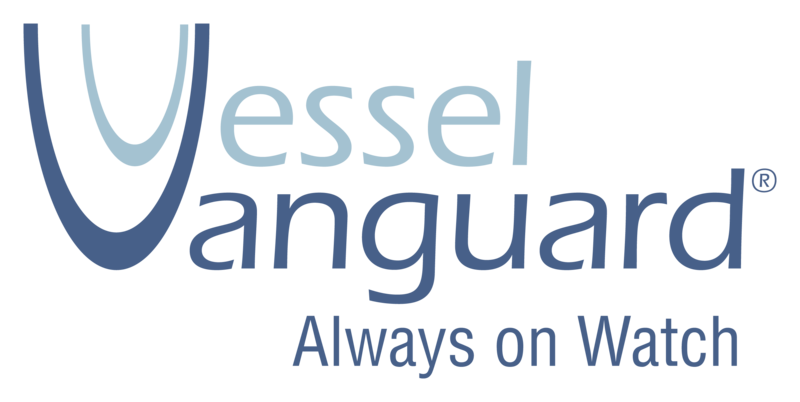 Although Navionics has taken some heat in the past for the accuracy of their charting data in the Bahamas, it is my opinion that they have made great strides to address the issue with their current generation “freshest data” package. 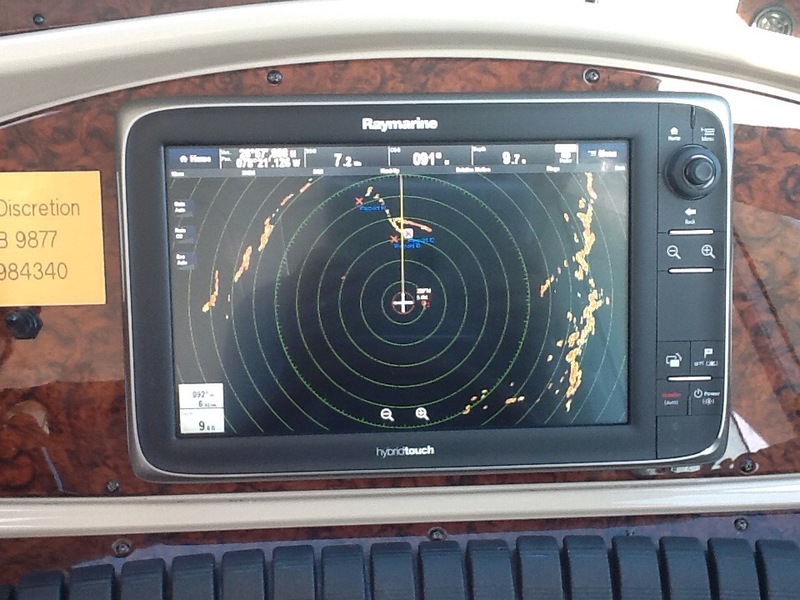 We found the information on our Raymarine E127 chart plotter regarding Double Breasted Cay to be precise all the way in and it was indeed helpful although the area clearly demonstrates why a mariner needs to be able to read the water visually while cruising in the Bahamas. Once securely anchored, the boys set out on their first snorkeling trip at Double Breasted Cay; they swam from the back of the Pilots’ Discretion over to Sand Key where they saw all kinds of marine life. 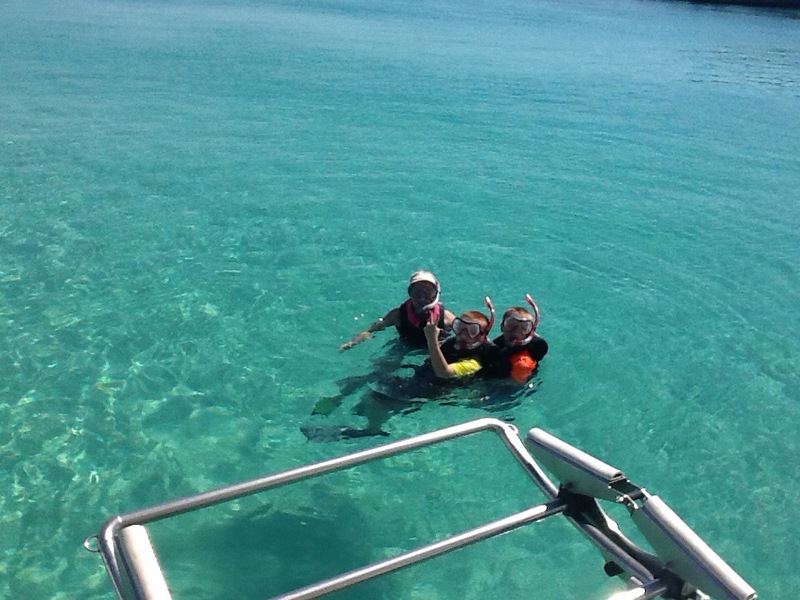 It was here that they saw their first Bahamian shark, a 4 foot black tip. In addition they got a good look at a barracuda as he swam under our boat. We enjoyed Double Breasted Cay so much that we elected to spend two nights there before heading south down the Sea of Abaco for Green Turtle Cay. The run to Green Turtle Cay was just over 60 miles and since we ran a portion of the trip at 25 knots , we were pulling into White Sound in the early afternoon. October is the slowest time of year in the Bahamas and as a result, many of the resorts and marinas are closed. We are staying at the Green Turtle Cay Club, a beautiful resort in White Sound. 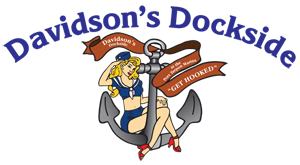 The docks are open but the restaurant and bar as well as most of the resort facilities are closed. That said, the staff that is here ( they have a maintenance staff doing facilities upgrades) has been super helpful. I had been here ten years or so ago by air and it is clear to me that they have done a great job of upgrading this great facility over the years. 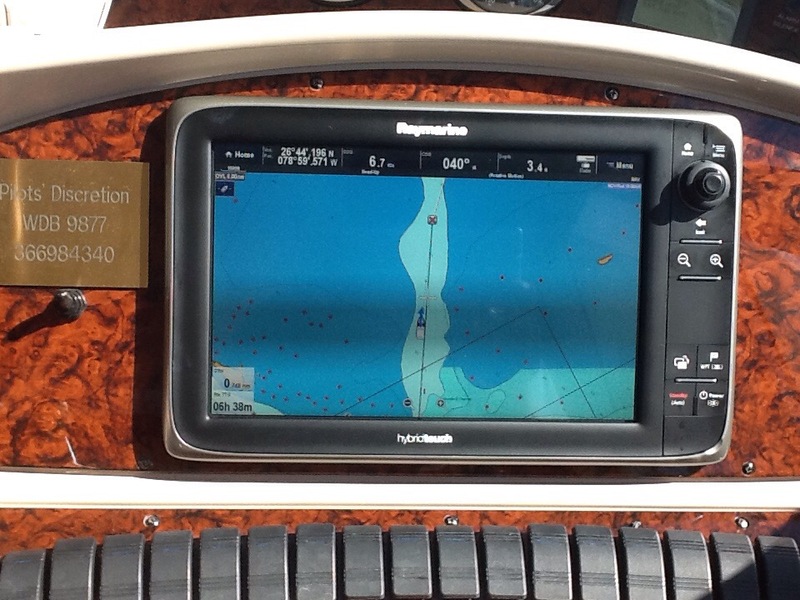 This entry was posted in Bahamas and tagged Bahamas, Cruising Guide, Double Breasted Cay, Grand Bahama Island, Great Sale Cay, Green Turtle Cay, Little Bahama Bank, Maptech, Navionics, Ray Marine E127, Sea of Abaco, Sea Ray Navigator, West End, White Sound on October 25, 2014 by Randy. Yesterday we had an enjoyable crossing of the Gulf Stream and are now savoring our first day in the wonderful country of the Bahamas. 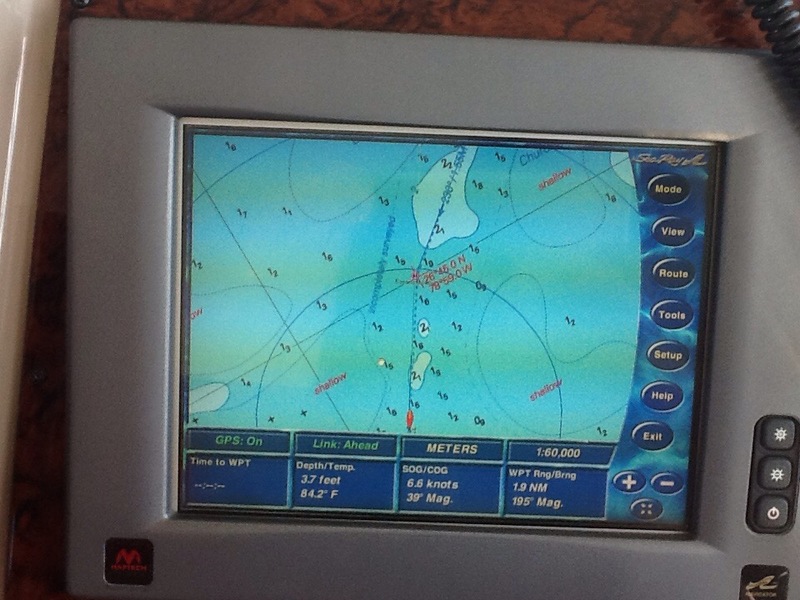 The weather models were showing relatively benign sea conditions for our crossing yesterday with 3-5 ft seas. There was a forecast for a line of squalls to develop over the Gulf Stream late yesterday afternoon with steadily steepening seas but after reviewing the available data, conferring with our weather Guru, Chris Parker, and taking a look at the NexRad radar on our chart plotter, we made the determination that we could make the crossing safely by staying in front of the developing line of inclement weather. Originally, we had planned on crossing at 8 knots (our most economical speed) but given the potential for developing weather we increased our speed to 17 knots to stay at a comfortable speed for the sea conditions and stay in front of the line of weather that showed ominously 3-4 miles astern of us as we worked our way across. In the end, we did have to alter our course slightly to avoid a couple of thunderstorms but other than a few minutes of moderate rain with a few 5 foot waves we had a smooth crossing. The customs and immigration procedures at the Old Bahamas Bay Marina could not have been more convenient. When we called in by radio (Channel 16, then switched to channel 10 ) we were told that Customs would not require us to tie up at their dock first but rather, sent us to our assigned slip and requested that the Captain report to the Customs and Immigration office after the Pilots’ Discretion had been secured in her slip. The paperwork was routine (helped significantly by the fact that the first mate, my wife Theresa, an immigration attorney who is type A, had converted all the Bahamian Customs and Immigration documents to fillable PDFs and had them completed before our arrival). Our Cocker Spaniel, Patton, was also pleasantly surprised when our concerns about bringing him ashore were completely dismissed by the Customs Officer. A very quick glance at his forms and veterinary health certificates and he was welcomed into the Bahamas. The boys could not believe how clear the water is here and when we turned on our underwater lights, they thought we had changed them somehow because in Tarpon Springs they illuminate an area about 3 ft astern of the Pilots’ Discretion while here in the Bahamas, the water is illuminated for about 50 ft astern. 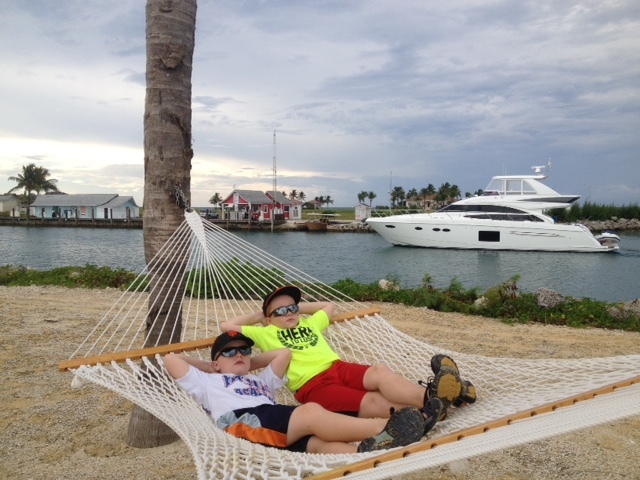 After a day spent relaxing and home schooling we will head out tomorrow to begin our exploration of the Abacos. First stop, Great Sale Cay then on to Green Turtle Cay. This entry was posted in Bahamas and tagged Customs and Immigration, Gulf Stream Crossing, Old Bahama Bay Marina, West End on October 16, 2014 by Randy.